Pre-Laid Mooring Systems. Right first time. Prior to the rig hooking up, we can deploy the anchor and mooring line to form a pre-tensioned mooring system. This is known as a Pre-laid mooring system. This pre-laid method works effectively for catenary systems. 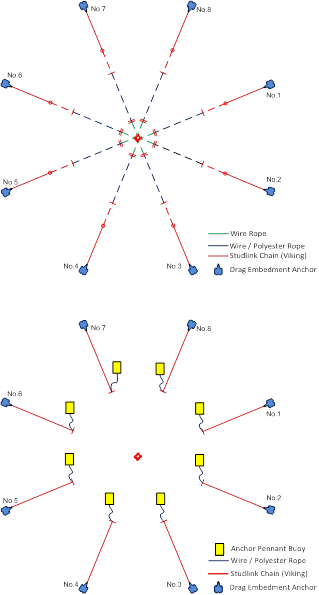 Pre-laid mooring systems offer a number of benefits for your operation: they allow for more accurate control of the tensions seen at the anchor - and important factor required for class authority standards. In addition, the system offers dramatic time savings when bringing the rig onto location and moving off location, as anchors are installed and recovered off critical path. The diagrams below offer a better level of insight into the structure and paths of a pre-laid mooring system.